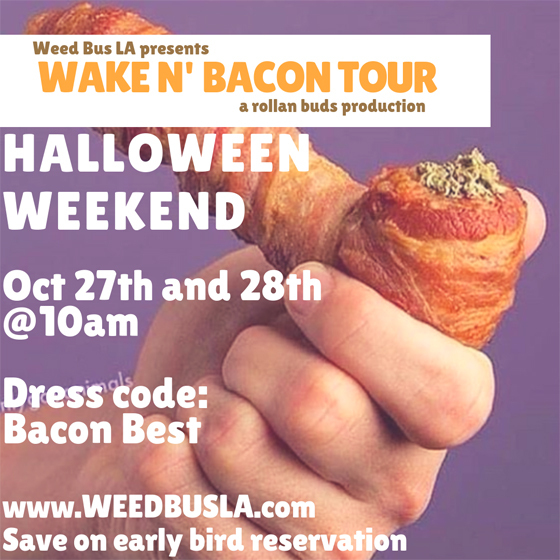 This Halloween weekend Weed Bus LA and Rollan Buds Productions presents 'Wake N' Bacon' bus tour. The 4 hour tour will bus our clients around to 5 restaurants competing for the Best Bacon in LA. The best part is our guests are the judges. The tour will run Saturday and Sunday (Oct 27th and 28th) at 10am. Bacon Flavored Vodka drinks and food will be provided. Great discounts from our sponsors PurBlend, Cobra Extracts, Tetralabs, plugplay and Yo buddy app will also be available at the starting dispensary, Smartweed Hollywood. The dress code is Bacon Best. So breakout those bacon earrings you've been holding on to, grab some friends and have a savoury halloween this year.